This issue of Truth Magazine is dedicated to the study of instrumental music in Christian worship. The issue was organized and the authors were selected by Johnie Edwards. He has relied heavily on some of his former students from the training program at Ellettsville, though obviously not every author studied there. There is justification for devoting this much material to a discussion of this subject. Many churches are less concerned with historic markers that distinguished Churches of Christ. A half century ago, those indicators of true Christian practice included a cappella music, baptism for remission of sins, weekly communion, church organization and men in leadership. Today, the distinctives are eroding, as the culture impacts the churches. Most of the markers are still in place, but the attitude toward their essentiality has changed. In the June 23,2008 issue of Christian Chronicle, the nation’s largest institutional church, the Richland Hills church in Dallas/Ft. Worth area, added instrumental music to its worship. Its preacher, Rick Atchley, was quoted as saying, “My e-mail is flooded with messages from elders and preachers across the country encouraging this church and praising us for the decisions we’ve made.” The church also made a decision to start offering communion on Saturday nights. In its January 22, 2009 issue, the Christian Chronicle announced that the Richland Hills church was being removed from its directory of churches. The directory of churches was prepared by Max Lynn until 2003, but since then has been compiled by 21st Century Christian. Richland Hills was one of twenty-one congregations omitted from the latest edition of the directory for using instruments of music in their worship. My view of these churches adding instrumental music to their worship is probably different from that of mainline representatives quoted in the Christian Chronicle. When I began preaching in the late 1960s, the division over church support of human institutions, church sponsored recreation (fellowship halls), and the sponsoring church was waning to a close. The fellowship of God’s people was divided. At the time, my brother Cecil gave me a stack of about 100 church bulletins and suggested that I write and request to be added to their mailing lists. The list included churches from both sides of the division. I soon began to see that the differences between the churches were much deeper than the issues over which we were dividing. The church bulletins from the institutional churches generally contained little, if any, distinctive doctrinal teaching. They were full of “Chicken Soup for the Soul” type of articles, announcements of upcoming church activities, and other matters relating to activities in the local church. By contrast, those bulletins which were being mailed out by non-institutional churches were generally full of doctrinal and moral teaching. The late 1950s, however, brought subtle changes in sermon content. To understand those shifts, one must recall the kind of piety that dominated American religion throughout the 1950s. During that decade, practically all major denominations promoted the role religion could play in fostering peace of mind. The emphasis found nationally recognized proponents in Judaism with Joshua Liebman’s Peace of Mind (1946), in Catholicism with Fulton Sheen’s Peace of Soul (1949), and in Protestantism with Norman Vincent Peale’s Power of Positive Thinking (1952). In such a climate, messages that extolled the “true church” and that condemned “the denominations” for their “false doctrine” were not likely to develop a significant following beyond the ranks of the faithful. This ministry was at a crossroads: it could continue to preach to the converted or it could seek to extend its reach. But if Churches of Christ wanted to reach out, conventional wisdom suggested that they could not expect to compete effectively in the denominational free market of souls unless they embraced the sort of “peace-of-mind” piety that dominated the national religious landscape for more than a decade. That is precisely what happened, beginning in 1960. In that year, Batsell Barrett Baxter, professor of Bible at David Lipscomb College and a nationally known preacher among Churches of Christ, began his career as a “Herald of Truth” television evangelist, later adding radio programming to his duties. He continued to serve “Herald of Truth, both on radio and television, through 1981, producing his last programs only months before his death in 1982. Through all these years, however, Baxter never had full responsibility for these programs; he always shared preaching duties with other evangelists. During the early 1960s, Baxter continued to preach on traditional themes pertaining to Church of Christ identify, to be sure, but he also introduced subtle shifts in emphasis that would be far-reaching in their impact on Churches of Christ. With increasing frequency, he explained to national radio or television audience how to achieve spiritual growth and peace of mind, how to develop healthy family relationships, and how to cope with anxiety and fear or with the various stages along life’s way. By the 1970s, these sorts of themes increasingly dominated “Herald of Truth” programming, and the sectarian themes so much a part of the identity of Churches of Christ for a century and a half receded far, far into the background. Hughes description of what changed in institutional churches also explains why some institutional churches of Christ are now adding instruments of music to their worship. After fifty years of preaching that neglected the identifying characteristics of the New Testament church, its worship, its organization, the terms by which it is called, and what is wrong with denominational names and creeds, a generation has moved into leadership roles who cannot distinguish the Lord’s church from the denominations around them. In 1973, the Herald of Truth alarmed some of its avid supporters when Lynn Anderson was quoted as saying that “the church of Christ is a big, sick denomination” (Memphis Meeting with the Representatives of the Herald of Truth, September 10, 1973, 43). Though this alarmed the more conservative element of the institutional churches, Anderson did express was has become more and more correct: the institutional churches of Christ no longer look upon themselves as different from the denominations — they are just one denomination among other denominations. Where are non-institutional churches at the beginning of the twenty-first century? Can anyone deny that the content of our preaching has changed? Can anyone deny that more preaching is being done on the “peace-of-mind” piety that characterized the 1960s Herald of Truth programming? Can anyone deny that there is less preaching on the identifying marks of the New Testament church? Can anyone deny that the “themes so much a part of the identity of Churches of Christ for a century and a half” have “receded far, far into the background,” as Hughes expressed it with reference to institutional churches in the 1970s? Alert brethren will learn from the mistakes that others have made. If we want to avert the same problem that is presently facing institutional churches of Christ on such issues as instrumental music in worship, baptism for the remission of sins, the role of women in public worship, the observance of the Lord’s supper on the first day of every week, etc., we are going to have to do more teaching and preaching on these subjects! 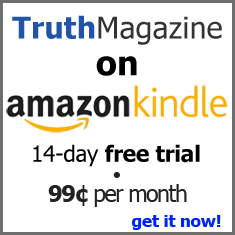 That is why we have produced this issue of Truth Magazine. We thank brother Edwards for helping us to pull this material together.